Nicklas Bäckström talked to some Swedish media outlets about the snowstorm that currently has a firm grip on Washington DC. The storm has brought havoc to the East Coast and has forced the Washington Capitals to cancel their games against Anaheim on Friday and Pittsburgh on Sunday. What will happen to the practice tomorrow? You live in a house in Arlington. Do you have a snowblower or will you have to make do with a snow shovel? I suppose you are used to this from your winters back home in Gävle? Earlier today I posted a snippet from an interview that Nicklas Bäckström did with his hometown paper Gefle Dagblad. I’ve now done a more comprehensive translation of the interview where he talked about his rehab training, where he is at in the recovery process, and what he thinks about the Caps’ new players. Gefle Dagblad posted both a video and a written piece of the conversation and I chose to keep them separate. It feels good. I have had good few months back home in Gävle but when August rolls around you feel that it’s time for hockey again, so it will be nice to go back to Washington again. So there haven’t been any complications? No, I don’t think so. Everything has felt good and I hope that it stays that way. You were just on the ice. For how long have you been training on ice? I think I’ve been on ice five time now, not too much. I didn’t want to go on ice before I was ready for it. I waited until it felt ok to skate again. Because of the injury I had to postpone my on ice training compared to when I have done it in years past. I have talked some with the doctor that did the procedure, he’s the person that I’ve been in contact and talked with the most. I think it’s really important since I don’t really know much about these things, so it’s good to talk to someone that actually does. The surgery took place in Washington? 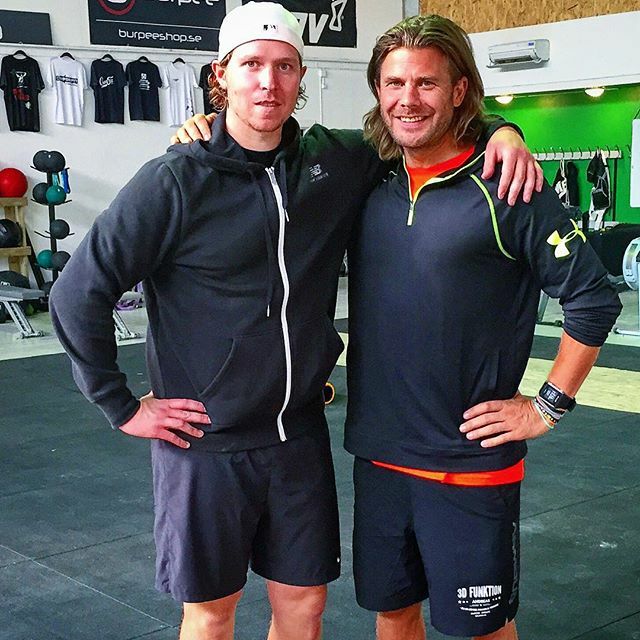 What does your personal trainer Andreas Öhgren mean to you? He has been really great. I got in contact with him after a tip from Sebastian Lauritzen that also had surgery done on his hip. They say that Andreas Öhgren is best in Sweden in his field, and I can only agree with that, I think. There are some new things going on in the organization, and I think we needed that. I would say that this past season was our best so far. We played more as a team and that’s what we have to do. But at the same time, the margins are thin in hockey. We had the lead with three games to one, and have a 1-0 lead when it’s one minute left of the game, they tie it, win it in OT and then they win two straight games. The margins are thin, but at the same time you have to learn from it. I know it’s boring as hell to keep saying the same thing year after year but you have to try to learn from it and move on. Of course it’s not fun that [Mike] Green is leaving but it’s part of the business over there, that’s just the way it is. Players move from team to team, especially since it’s hard to fit all players under the cap. But he’s coming to another team, a Swedish team, Detroit. I wish him all the best and I’m sure we’ll be talking some during the season. Is Justin Williams the Washington Capitals best new player? I would say that he and [T.J.] Oshie are equally good. I think a player like Justin Williams, who has won three Stanley Cups, is going to be so great for us. To get all that additional experience in the locker room, since we actually do have a pretty young team. It’s always good to have players that know what it takes in the locker room. Do you still view yourself as young? How has having a daughter affected you as person and as a hockey player? Of course it has affected me a bit. It’s new type of life you live after you have kids. It’s so great to get home from practice and be with her instead of thinking about hockey 24/7. Have any of your Washington teammates, Ovechkin maybe, ever been here for a visit? No, he hasn’t. He is plenty busy back home in Moscow. Bäckström doesn’t want to talk about how serious the procedure was. He has been rehab training with Andreas Öhgren for two months. Are you going to be ready for the start of the season in October? Bäckström also talked briefly about his allergies. Video of Bäckström skating and shooting. Report: Nicklas Bäckström to have hip surgery this summer? Nicklas Bäckström did an interview with Swedish radio station Sverigesradio. The interview was published on July 18th. I posted the first part of the interview a month ago, and at long last, here’s part two. You are an assistant team captain now. How has your role changed since you first arrived in Washington? I was really young when I first came over. I tried to learn from the older more experienced players how to play the right way. That I’m an assistant captain is something that just happened, it’s not something that I sought out. I’m not really that person that stands up and yells at people in the locker room but I’m not shy about it if something needs to be said. I’m trying to lead by example on the ice. I think it’s important that everyone that is on the team is part of the team. That everyone can say what’s on their minds. It’s a big group after all so it’s only natural that people view things differently on occasion. Who on your team do you like to hang out with the most? I’ve been very good friends with Mike Green, but he is moving now. He’s been my best friend on the team ever since I first arrived. We have some Swedes too, Marcus [Johansson] is there and he has been there for awhile now, so I’m very good friends with him as well. Those are the two guys I usually hang with. The things is, though, that when we go on longer road trips you usually hang with all the boys on the team. We have good guys on the team and when everyone hangs out with each other it’s good for the team spirit. How is a player like Alexander Ovechkin when he’s not on the ice? He’s a funny guy, very relaxed and willing to make fun of himself. He’s just a normal guy. If Washington has a chance of winning the Stanley Cup. That’s of course the biggest goal I have in life right now. I think we played better this past year. It was a step in the right direction and we had a good coach coming in with a good system. We had a lead 3-1 lead against the Rangers, so we should probably have beaten them. It was a really tight series. We have made some changes during the summer and hopefully that can be a good thing. They brought in some more experienced players that have been around the block a few times. It feels good actually, fun. I’m hoping that we can keep some players that have expiring contracts, too. With them on the team we can be even better. [Ed. Note:The interview took place before the re-signing of Marcus Johansson]. How long does it take to get over a loss like the one against the Rangers? It was pretty unreal, actually. You agonize over it for a long period of time. It’s constantly in the back of your head for weeks after. But at the same time, you have to try to learn something from it, and move on, both as a group and as an individual. You just feel so empty afterwards, and you don’t know what to say. You just keep thinking how could it happen? But at the same time, you have to try to get over it and look forward to the next season. It’s an old cliche but there will be a next year. Learn what you can learn and be better next year. You know that you have 82 games ahead of you and the playoffs on top of that. Are you going: Yippie! Now it’s hockey around the clock again! Or is it more 82 games again…. It feels good and it’s fun. I always have the feeling before every season that this will be great fun. If you don’t have that then maybe you have some problems. The season usually just flies by. You think to yourself, 82 games, damn that’s a lot, but it goes by so fast, and before you know it, it’s playoff time again. The best player I have played with…I play with Ovechkin and he’s one hell of a goal scorer. But I like Swedish players that I have played on the National team with: Lidas [Nicklas Lidström], Foppa [Peter Forsberg], Zäta [Henrik Zetterberg], Kronwall [Niklas]. Kronwall is a guy that grew a lot in my eyes during the Olympics. I was really impressed by him both as a leader and as a player. How do you view Tre Kronor in light of what happened in Sochi? Is it still a bit grrrr inside when you think about it? I don’t think about it at all now. The only thing is that I’m disappointed that I missed the final, that was really sad but I don’t think much about it other than that, if I’m being honest. What’s done is done and there’s nothing I can do about that now. You have to forget it and move on. Did you feel at any point after the Olympics that you never wanted to play with Tre Kronor again? No, I never felt that way. It’s always fun to play for your country. Next year World Cup is happening again. Is that something you are excited about? I have heard that it’s a fun tournament and I would love to play if I got chosen for the team. In a tournament like that you will have all the best players in the world, almost like it is at the Olympics. It would be fun to measure yourself against the best players in the world again. Apart from winning the Stanley Cup, is there something else you want to win in your career that you haven’t won yet? That dream is not there anymore? You never know. It depends on how long you play and if you can avoid injuries. And if someone if even will want me when my contract with Washington expires. Your contract lasts until 2020 so you have some years left. Yes, that’s how it is. Is it nice to have such a long contract and to know what you will be doing years in advance? For me personally it is. It feels safe to know that I hopefully, if I don’t get traded, will remain in the same place. I have my home there, my friends. It feels like home and if you like where you are at, you play good, too, so it’s really important. Since we already touched on it, it used to be called the Swedish Elite League, it’s the Swedish Hockey League now. Would you consider playing there in the future? Absolutely. You never know what’s going to happen in the future. 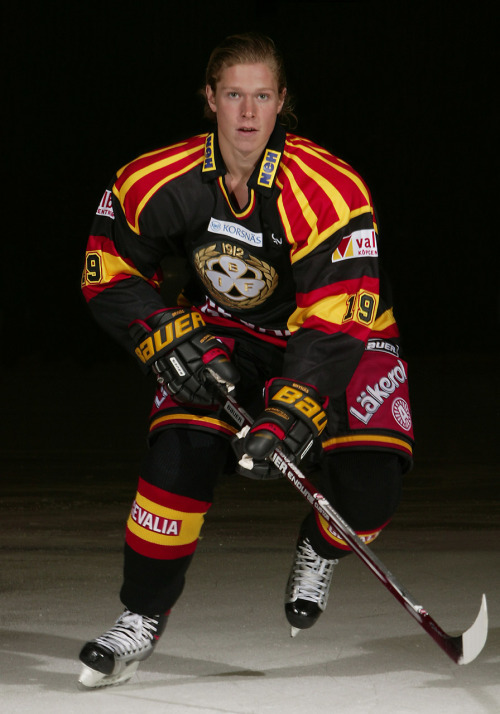 I’m a Gävle guy and a Brynäs fan from birth so of course it would be great to put on the Brynäs jersey again. You never know, we will just have to wait and see what happens and where the road may lead me. 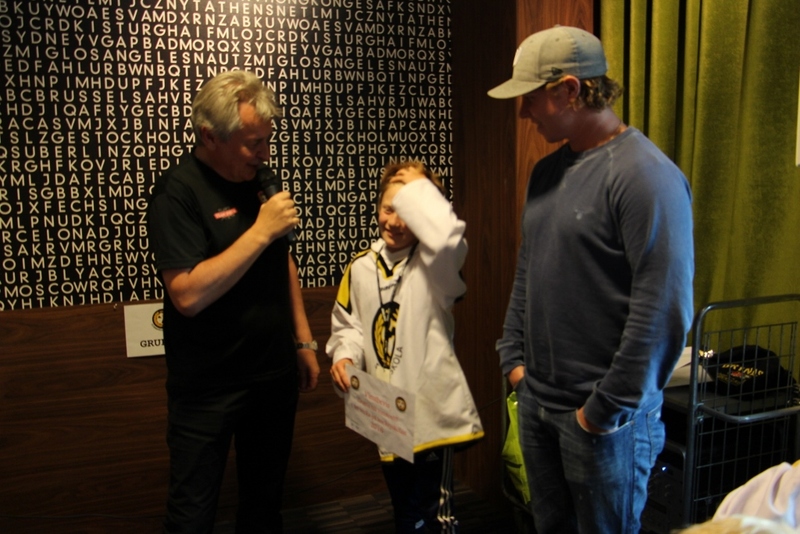 From around July 19:Bäckström at Brynäs hockey school. Photo Credit: Brynas. 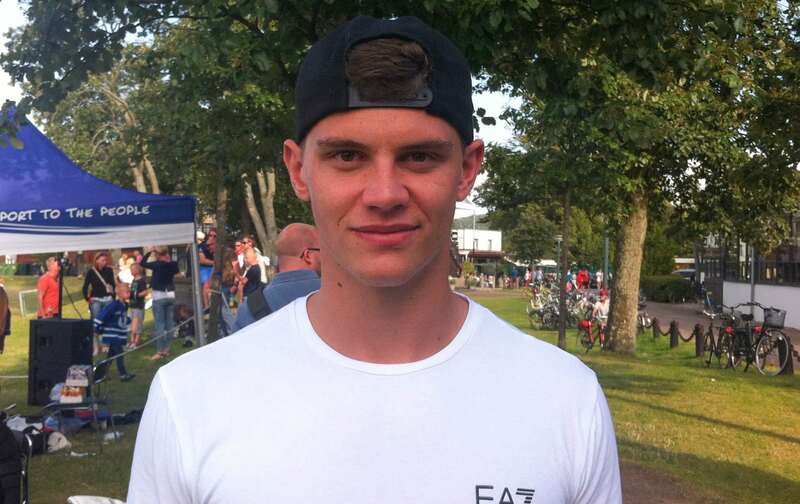 André Burakovsky gave an interview to Swedish news agency TT. The interview was published in Swedish newspaper Dagens Nyheter on August 11. 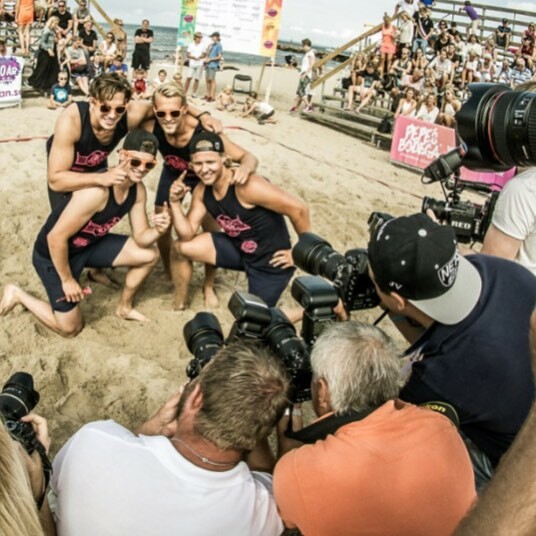 The interview took place in late July in Båstad where Burakovsky played in a volleyball tourney and took part in a slap-shot competition, among other things. In the video Burakovsky said that he plans on leaving for Washington on September 10th. “You really have to work hard every day and truly want to get better. It’s hard work every day and the training sessions are not easy by any stretch of the imagination. It always feels great once you’re done, though. 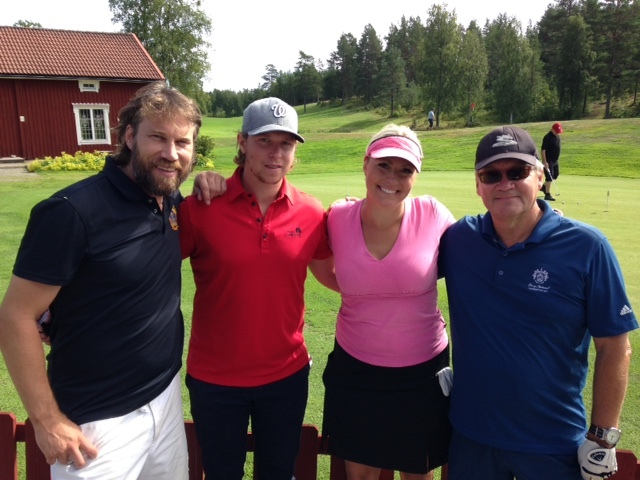 Burra in Båstad with Rikard Rakell, Hampus Lindholm and Patrick Cehlin. Photo Credit: Rikard Rakell,’s IG. The Washington Capitals’ trainer gave Burakovsky a training schedule to use while he works with his own trainer, Jonas Morin, in Sweden. 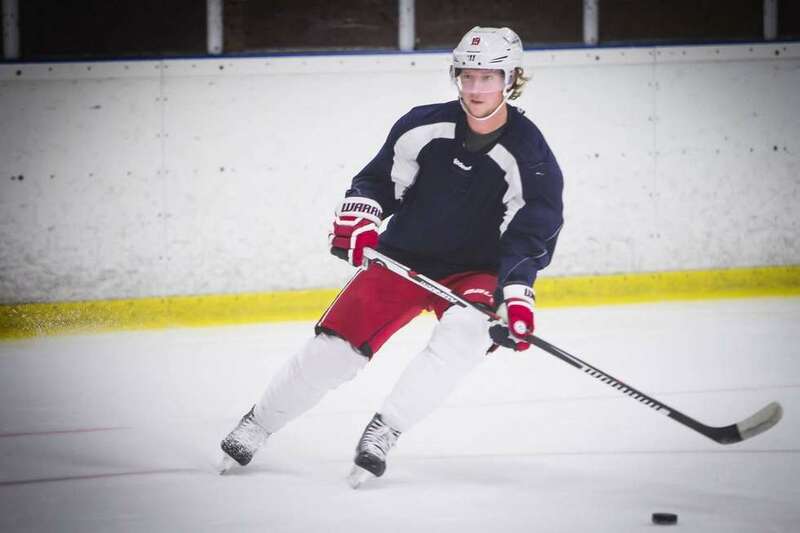 His Swedish trainer keeps in contact with the team in Washington during the summer. “I wake up at eight and then I go to the gym where I start working out at around nine. After that I go back home to eat lunch, and then I’m back at the gym again at around five o’clock. 6:43 into his first NHL game he scored his first NHL goal. With that he became the first Washington Capitals’ player to score in his first game, since Alexander Ovechkin did it in 2005. It was an up and down season where Burakovsky played both with the Hershey Bears in the AHL, and on the top line in Washington. He also got his first taste of what the Stanley Cup playoffs are like. That's some pretty decent shooters for Malmö's goalies to deal with during warm-ups. Marcus Johansson lives in Karlstad during the summer and he has been working with trainer Johan Asplund this summer as he has in the past. Asplund was the the trainer for the Karlstad based SHL team Färjestad for eleven years and now he is back on the job after a few years off. 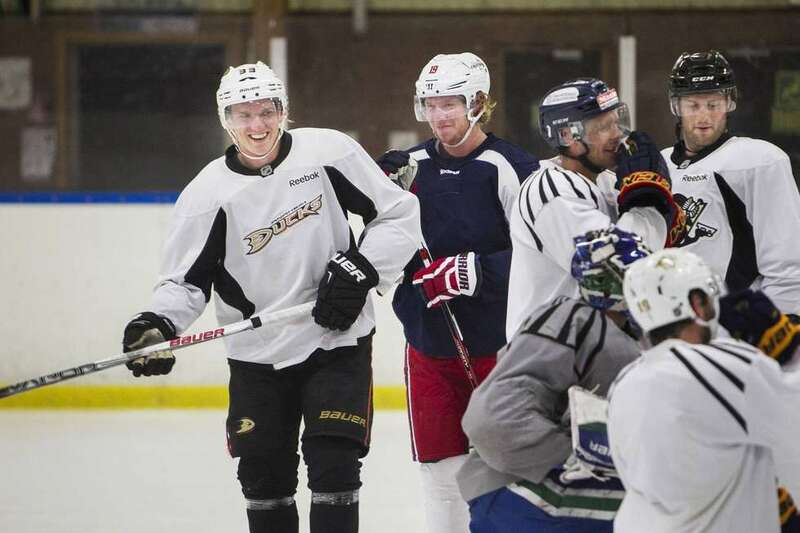 Fellow NHLers Jonas Brodin and Oskar Klefbom are also part of the same training group as Johansson. Marcus Johansson is currently a restricted free agent (RFA), and earlier this summer Johansson and his agent chose to file for a player elected arbitration. In most cases the teams and players come to an agreement before the arbitration hearing. But when they don’t, things can sometimes get ugly like when Mike Millbury, then the general manager of the New York Islanders, made Tommy Salo cry during an arbitration hearing. Hopefully it won’t come to that during Marcus Johansson’s hearing, if they indeed get that far. According to the Washington Post the hearing will probably happen: “Several sources that have indicated that both sides are trending toward a hearing”. Reached via email recently, Johansson’s agent Marc Levine wrote, “Nothing to comment on at this point other than we continue to prepare for the arbitration hearing.” The arbitration hearing is set to take place on July 29. Marcus Johansson is spending his summer in his old hometown of Karlstad, Sweden, the city where he played for Färjestad from age 16 until he left for the NHL in 2010. When speaking with Värmlands Folkblad, Johansson said that he couldn’t reveal much about the negotiation between the two sides and he didn’t seem concerned at all about not getting a new contract in order. The Washington Capitals have about $10.3 million in cap space left to sign goaltender Braden Holtby, who is also scheduled for an arbitration hearing soon, and Marcus Johansson. Holtby is asking for $8 million, and the team is offering $5.1 million, per Alex Prewitt. Meanwhile, Marcus Johansson is asking for $4 million plus, and the team wants to keep him closer to $3 million, per Prewitt again, via Sportsnet. I should point out that at the time Värmlands Folkblad interviewed Johansson, Holtby was thought to be asking for $1.5 million less than the $8 million figure that surfaced today. Marcus Johansson also discussed the 14 game long playoff run against the Islanders and the Rangers, and describes the series against the Islanders as a [old school viking style] holmgång. 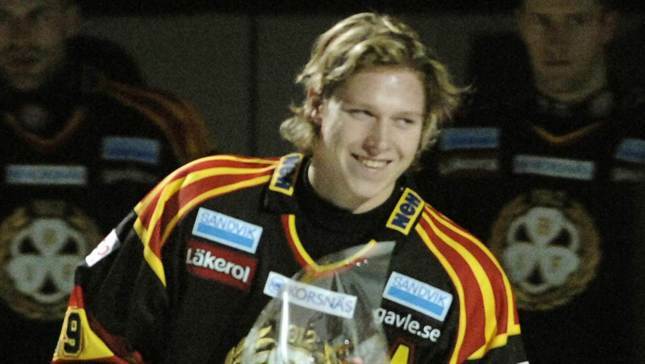 Additionally he reveals to Värmlands Folkblad that he was playing through an injury in the playoffs. He didn’t specify when exactly the injury occurred, but one possibility is this collision with Cal Clutterbuck in game three against the Islanders. Nicklas Bäckström did an interview with Swedish radio station Sverigesradio. The interview was published on July 18th. My translation of the first part of the conversation is below. When you get home for the summer, the main thing is to spend time with family and friends that you don’t get the opportunity to see during the season. Training takes a lot of time as well. I’m trying to enjoy the Swedish summer, not that it’s easy on a day like this when the weather is bad. But at least we had some nice days earlier in the summer. I like to sit down for a cozy barbecue dinner and just hang out and talk with family and friends. I have a daughter now and it’s great to watch her grow and develop every day. How much do you train during the summer? Could you take a couple of weeks off after the season had ended? I usually take about 14 days off, but since I underwent surgery after the season ended, I had to rest a bit longer than that this year. In a normal year I like to get things going pretty soon after the season has ended. The training gets more ramped up as the further into the summer you get, and later on I go on ice as well. Personally I like to start my training for the upcoming season almost right away after the previous season has ended. 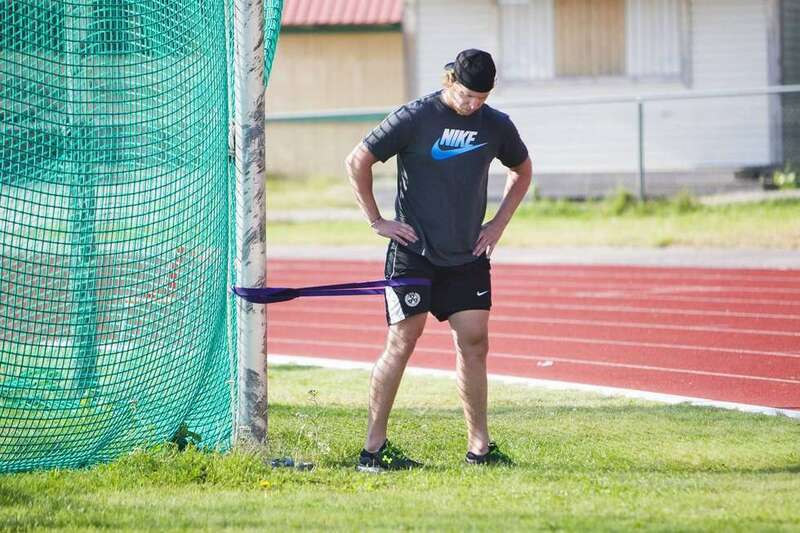 Nicklas Bäckström rehabbing while talking to Gefle IF’s trainer Johan Holmström. Photo Credit: Magnus Hägerborn, Gefle Dagblad. What type of injury did you have that required surgery? It was a hip injury that I had the surgery on and I felt it was time to do something about it. I can’t say that I’ve been tortured by it, what can I say? I have felt it during the season and wanted to get rid of it. So you had it for the entire year? Since sometime in November. I didn’t really feel it when I was playing because during games you have other things to think about (laughs). It sure sounds serious. You obviously don’t undergo surgery for kicks and giggles. It’s been a cause for concern and I wanted to take care of it, so that I did. So you are not fully recovered yet then? No, it’s going to take some more time. We will just have to wait and see how things go exactly, but of course I’m hoping that I will be ready for the start of the season. When you are home in Gävle, like you are right now, are you getting a lot of attention from people wanting to get autographs? Heh. It’s pretty calm on that front. I think people in Gävle are pretty used to me being here so it’s not really a thing, and I’m maybe not the guy that’s out on the town very much either, so..
What’s your hometown now, as you see it? My hometown will always be Gävle, and Valbo since that’s where I’m from. But at the same time, I spend most of my time in Washington and that’s where I live for at least 10 months of the year. In the beginning when I got over there it didn’t feel like home but you grow into it gradually, and I have to see it as my home now. Gävle will always be home for me since that’s where I spend my summers and that’s where I’m from and where I grow up. You are good at hockey but where you good at any other sports growing up before you chose to focus on hockey? I played a lot of floor hockey, soccer, golf and tennis. I was pretty decent at floor hockey and golf. I don’t know, but I think I have some ball sense, so maybe that’s why. I like to do a other sports than just hockey, it’s fun. Do you think you could have been as good as you are at hockey in any other sport? I don’t know, it’s hard to say but if I were to start over from scratch I would want to see how good I could get at golf. It’s not too late. You can pick it up after your hockey career is over. Yeah, you never know. Maybe I could try to qualify for the senior tour (laughs). How old were you when you started focus only on hockey? I think I was fourteen. That’s when I moved from Valbo to Brynäs and that’s when I decided that I would do hockey full time, in the summers as well. Nowadays kids might have to start focusing only on hockey as early as seven to nine years old. What do you think about that? I think It’s deplorable. I think it’s good that they can try out different types of sports so they figure out what feels good. Besides, who can really look at a nine year old kid and see that he will be good at seventeen or eighteen? No one can do that. I personally believe that you should try out as many sports as you can and want so that you can figure out what you like. Also, it’s good that they get to go outside and get moving. It’s great. You really like to workout and practice. Absolutely. I always had in the back of my head that the way you practice is the way you play, and I think there is a lot to that. Maybe things are a little different when we have a lot of games in a short time frame. Maybe then you have to hold back on the training and practice and focus more on recovery. But when you do have a couple of days between games, I think it’s important to have good practices and by practices I mean on ice sessions. With the amount of games you play how much time do you really have to practice? Yes, sometimes it’s at least four games a week. At the beginning of the season, the practices tend to run longer. During the season, especially at the end, they tend to get shorter. It gets more important to think about getting enough recovery time in since the body gets beaten down playing that many games. It’s a delicate balance that you have to strike, really. All coaches are different and they also have to talk to the players to figure out where the players are at and how much treatment they need. There’s a lot of things to consider. A normal practice usually lasts 45-60 minutes. At the end of the season it’s more like 30 minutes. Can the play suffer and decline when the practice time gets cut in the second half of the season? Yes and no. For some players, they feel better when they can go out on the ice and feel the puck so they don’t lose their feeling. Other players need to rest to be able to focus, so that they can perform at their top level. I would say that it varies a lot from individual to individual. I’m both. Sometimes when things aren’t quite working, I like to go on ice to try to get the feeling back. But other times when your body feels totally spent, it might be better to rest. Next season will be your ninth season in the NHL. Is it pretty much the same or have a lot of things changed in the league? I would say that the league is faster now. I thought the tempo was high when I first got over there but it’s even faster now, especially in the playoffs. That’s when you really see how much it changes from the regular season to the playoffs. The speed in the playoffs is so damn fast. Also, when I first came over, there were a lot of fighters in the league. Every team used to have one player that was a fighter and that’s not the case any more. Maybe you can say that it’s a more skilled league now. Is it more fun to play in the league now when the game is played with more speed? Yes, it’s awesome. That we play on a smaller ice surface makes it go even faster, that in turn makes it an even bigger challenge, and I really enjoy that. I think it’s more fun for the fans, too. Is it more fun to play on the smaller rink than on the European sized rink? Absolutely. Smaller ice surface, greater challenge and more entertainment for the fans. You can suddenly get a scoring chance from nowhere, one little mistake is all it takes. Since the European ice surfaces are bigger, the distance to the goals is bigger too. You don’t get the dangerous chances as you get on the smaller ice. So I personally think that it’s much more fun to play on the smaller rink. I would have thought that for a player like you, that sees the ice as well as you do, would have preferred to play on the bigger ice sheet, you would have more ice to “show off” on. Yeah, but it’s more ice to cover as well (laughs). In part two of the conversion Bäckström talks about having a leadership role on the team, who his best friend on the team is, and who’s the best player he has played with, among other things. Read more about Bäckström’s rehab training here. NoVa Caps fans has also written about the same Bäckström interview. You can read their take here. 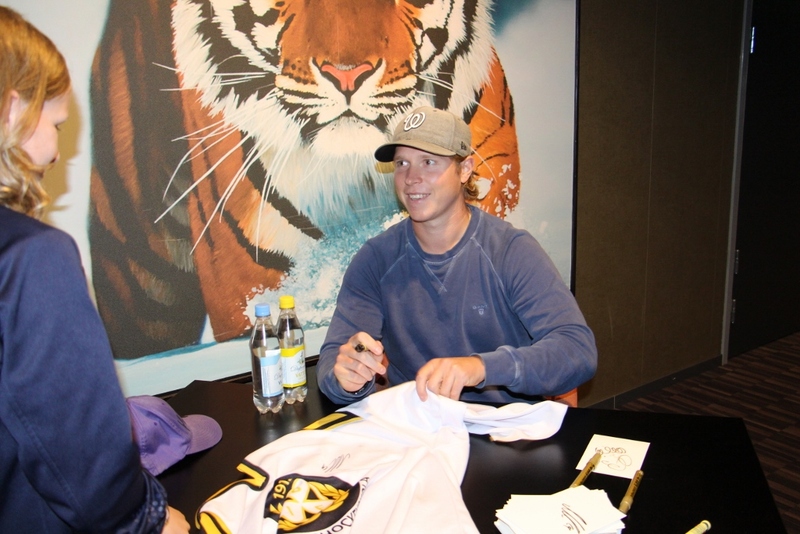 Nicklas Bäckström is back home in Gävle, Sweden for the summer. 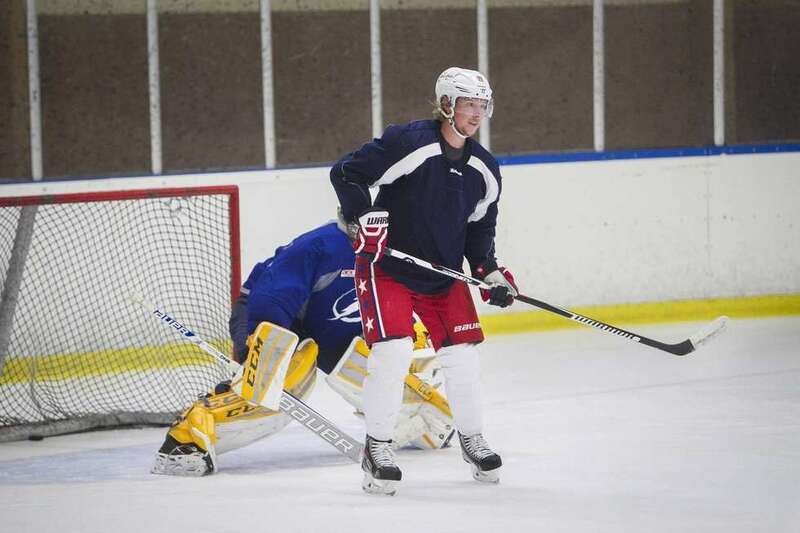 Gefle Dagblad’s Magnus Hägerborn stopped by the training facility where Bäckström and some other NHL players such as Calle Järnkrok, Elias Lindholm, Anders Lindbäck, William Karlsson and Jacob Markström are preparing for the upcoming season. It is not a normal summer of training for Bäckström, though, because this year he is forced to focus solely on rehab training after having a surgical procedure on his hip. During his talk at the National Press Club, Barry Trotz said that the team is exploring adding another center and that the injury wasn’t a problem until about February when they had to start monitoring the situation more closely. (click here to get the full quote from Alex Prewitt of the Washington Post). Earlier in the week when Trotz was on the radio on “Elliot in the Morning”, he expressed some concern that Bäckström would get behind conditioning-wise since he is only allowed to do rehab training. With that in mind, it is nice to see video of Bäckström working up a sweat on stationary bike at the multisport facility called Korpen Gävle Strand. Just like last summer when Bäckström worked out at the same facility in the crossfit section, it is not the most luxurious part of the facility. It is small and crowded. 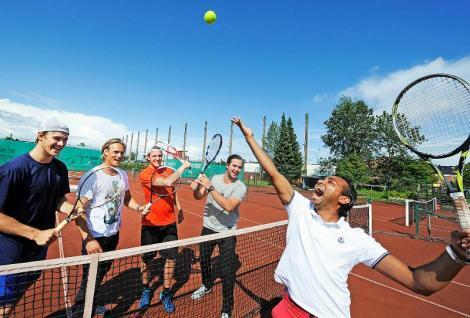 But it is still where a handful of Swedish, mostly Gävle based, NHL players choose to train. “I like the environment and it feels good to be here,” Bäckström told Gefle Dagblad. “It definitely makes the training easier when you know you have people to buzz with later,” said Jacob Markström. Anders Lindbäck started the trend of working out at Korpen Gävle Strand. 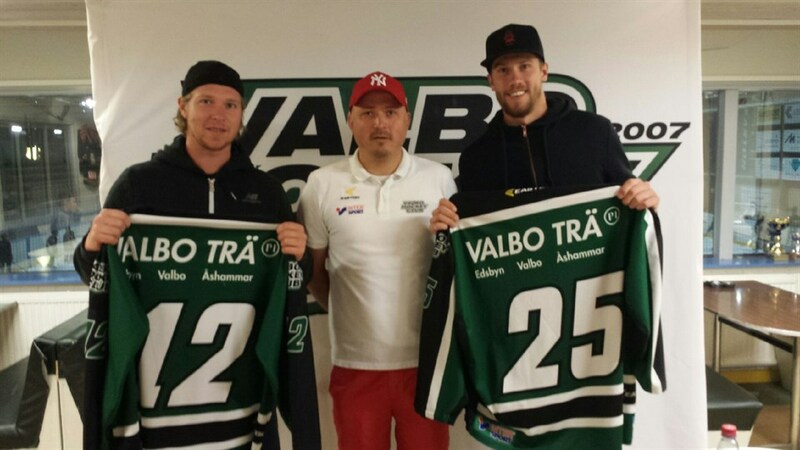 The other players who followed Lindbäck train a lot together but Bäckström can not join them this year. Instead he works out alone, going through his rehab exercises from the trainers in Washington. ”It’s back to basics that is the thing right now. Working with machines is almost dead now. People have realized that this is the most natural and efficient way to train. 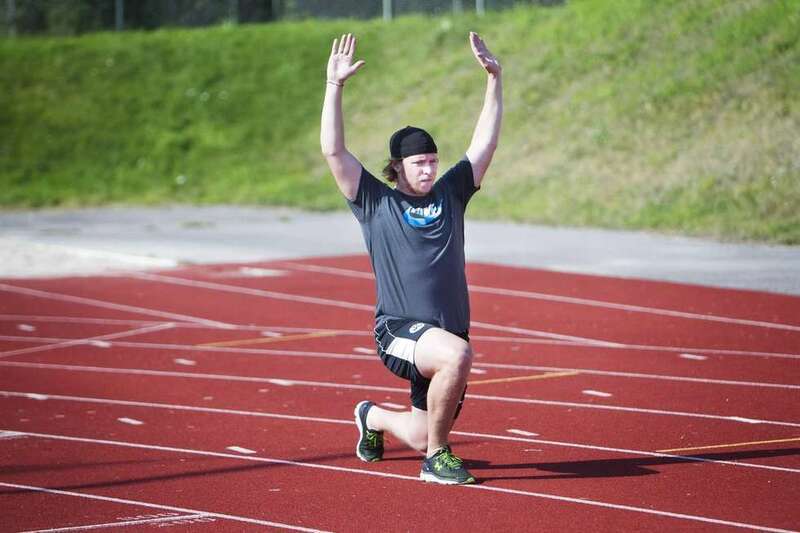 Even if the hockey guys are not doing pure CrossFit, it’s the feeling they are after,” said Johan Holmström, the trainer for the local soccer team, Gefle IF, that practices at the facility.